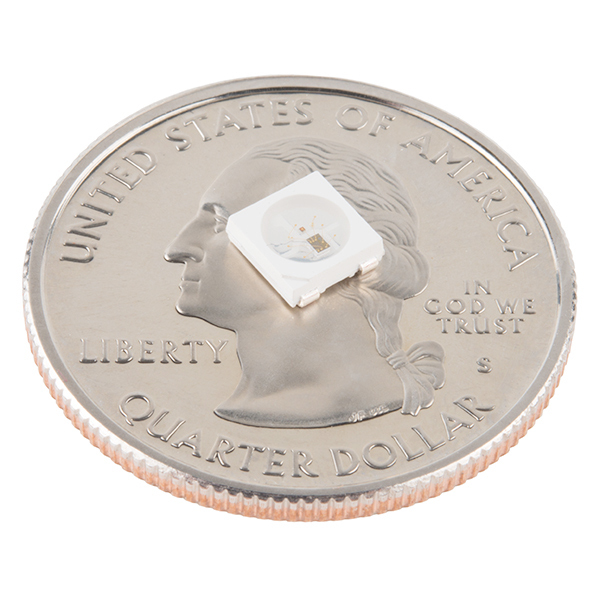 The WS2812B (or "NeoPixel") may look like a common 5050-sized (5x5mm) SMD LED, but there’s actually an integrated control circuit embedded inside there too. If you look really hard, you can see the tiny black chip hidden in there, along with minuscule gold wires connecting the chip to the LED. This LED is certainly more than meets the eye! The 'B' at the end of the WS2812 name denotes that these specific LEDs are equipped with and only require FOUR pins instead of SIX! The LED itself is unlike most RGB (Red/Green/Blue) LEDs. The brightness of each color can be adjusted using a serial string to one of 256 different levels. That means there are 16,777,216 (2563) possible combinations of colors. You can produce any color from white to black (off), or salmon to sienna. just how long is the strip? it says that 5x5mm stip of ten but i'm new to this hole electronics tinkering world. and can anyone be so kind as to tell me if and how i can connect a bunch of these strips together? and yea i know lots of Q- but can i cut the strip if needed to desired length? like i said i'm new at this so try not to go hard on me when replying or commenting lol. This is not a ready to go strip. These are individual LEDs that come on a tape and reel. 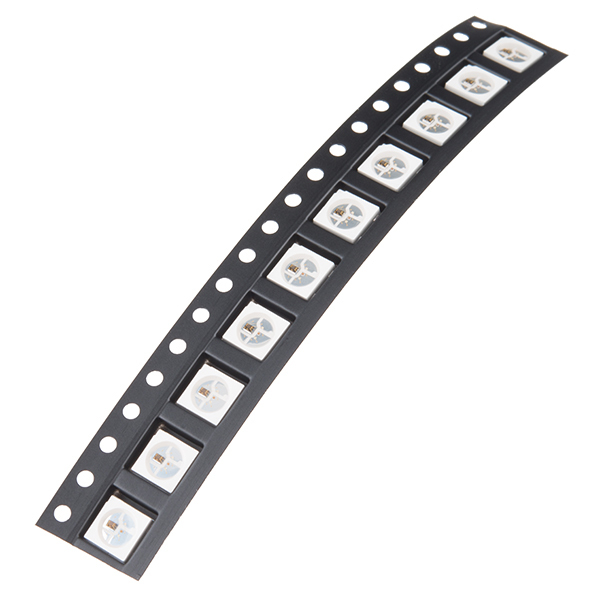 We are cutting off lengths of 10 and selling them, but they still need to be soldered into your circuit. For ready to go strips check out some of our other ws2812 parts. Lame product description... To use these you connect them in a serial string and shift brightness and color information into them (as outlined in the docs). You don't have direct control of (or need to worry about) forward voltage or PWM for brightness. Why do you have Forward Voltage for a chip that runs TTL data input. Probably because an LED still needs voltage to turn on.. These LEDs were easy and fun to work with! The only downside to working with such small LEDs, and other small components as well, is the pins ended up being very fragile. After soldering, be very careful with handling the LEDs. The solder joint was stronger than the pins themselves. On 4 of my LEDs, the Din pin snapped off because of an accidental tug on the wire that was soldered to it. I guess that's the trade-off for having small components, however. Used on several projects and they're great! They've been very reliable and worked consistently. I've purchased over 200 of them for projects and never had any troubles. I was really impressed with the colors these modules created, just so vibrant they are mesmerizing. Good LEDs, but not packaged correctly. The LEDs are good (as expected, so five stars), but the packaging leaves something to be desired. According to the datasheet these need to be baked for 48 hours at about 70C unless they were already baked and kept in a sealed package. They are extremely fragile internally, and tiny amounts of moisture will turn to steam when soldering, causing internal damage (one color might be out, or perhaps the entire LED will fail). If you bake the LEDs (as the datasheet requires), the LEDs will dry out and will be much less likely to be damaged during assembly. The datasheet recommends using the LEDs within 2 hours of baking, or within 2 hours of removing from a sealed package. Mouser and other distributors recognize this and ship components pre-baked and in a sealed package, and SFE should consider doing so as well. I know from personal experience that baking (dehydrating) these LEDs before soldering is absolutely critical (at least during the more humid summer months). Even if not baked and sealed, SFE should at least include a note to the user warning of this critical step.